Finnish design graduates Arttu Kuisma and Juho Kruskopf have produced a set of ceramic pots and vases that look deceptively squidgy. The Drapery collection was made by first sewing fabric in the shape of a vase and hardening it with resin. A plaster mould was then made of the fabric vase and the final piece was cast in ceramic and glazed on the inside. Kruskopf and Kuisma recently graduated from the furniture design course at Lahti University of Applied Sciences in Finland. Yesterday we featured another design by Kuisma - a shelving system held together by colourful steel tubes. We also previously featured a chair made from rolled up carpets made by Kuisma and fellow student Janne Melajoki. Photographs are by Niclas Mäkelä. 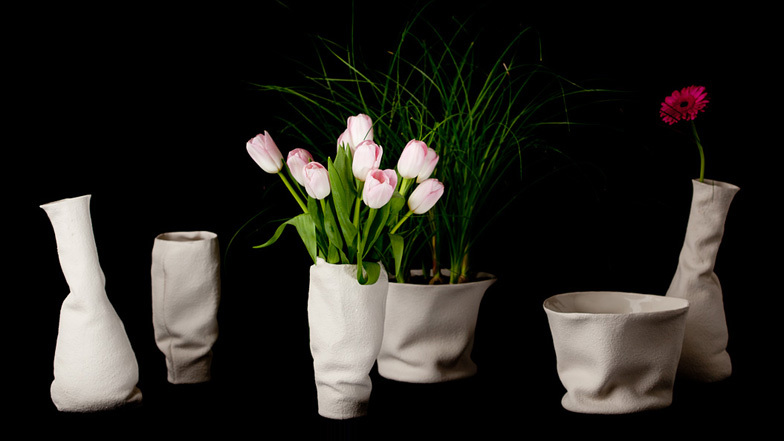 Drapery collection is a series of vases inspired by the delicate, momentary nature of fabrics. Our intention was to imitate the natural beauty of fabric and apply its characteristics to another material (in this case ceramics). The main challenge in the project was being on the edge of man's ability to shape an object, as the resin-soaked fabric behaves in a particular way and cannot be shaped exactly as you would want to while maintaining a natural look. You could say it almost has a mind of its own. We could only create the outline of the product and let the model dry in the shape most natural to it.